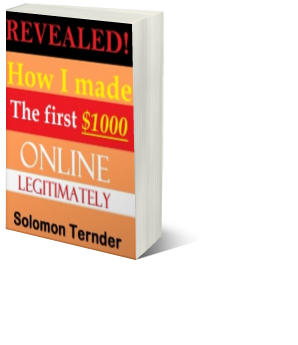 Solomon Ternder's Blog: FREE REPORT: HOW I MADE THE FIRST $1000 ONLINE LEGITIMATELY and YOU CAN TOO! 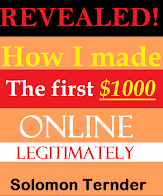 FREE REPORT: HOW I MADE THE FIRST $1000 ONLINE LEGITIMATELY and YOU CAN TOO! I made my first $1000 online and you can too! I remember when I would pick a copy of Success Digest every week and read like a newspaper. Success Digest is published by Success Attitude Development Center, Lagos, Nigeria. That continued till I left the university without applying anything I learnt from the paper. Somehow, I knew I would one day start making money from all the knowledge I acquired. Now I have since started applying what I learnt and have been earning daily from the internet. By the grace of God, I am the TheProBlogger at www.moringawealthandhealth.com and it is ranking on Google page one for Moringa seeds keyword. I have monetized it with Google adsense, Amazon Affiliate and sell information products(Ebooks) which combined, has generated over $1000. My dream of making money online has been realised and it is getting better by the day. There is joy in making passive income. I now make money even while sleeping! If you are wondering if truly money is made from the internet, I can tell you I was once in your shoes, but now I know better. And it can only get better. The good news is you too can! Download this ebook and read the entire report to see my earnings from Amazon, Gumroad(ebook sales), Adsense, etc. You are next in line if you make it your passionate dream.